celebrating the diversity of filipino beauty. #MagandangMorenx, literally translated to “beautiful brown skin”, is a campaign dedicated to challenging the traditionally enforced beauty standards within mainstream Filipino media. From whitening creams to an entertainment industry saturated with mestizas, the legacy of the 333 Spanish colonization of the Philippines can still be felt in this worship and desire for white skin. Tan and brown-skinned Filipinos are made to feel insecure, ashamed, and embarrassed of the natural color of their skin despite being indigenous to a cluster of tropical islands in the southeast Pacific, where the geography and climate make brown skin the norm. #MagandangMorenx was created in 2016 to empower, reclaim, & redefine what it means to be a Filipino & celebrate our diversity of color. Hello! My name is Asia Jackson and I’m a half-Filipino, half-Black actress and digital creative based in Los Angeles. I used to live and go to school in the Philippines, and I remember being bullied for having darker skin. Every moment I spend there, I became increasingly more aware and frustrated with the colorism so deeply embedded into the culture. The toxic idea that dark skin was ugly, made me ashamed and embarrassed of the color of my skin. It took my a very long time to love my color as it is, and I never want anyone to feel the way I did. I created #MagandangMorenx in October 2016 to help open dialogue for an issue that is widely ignored in mainstream Filipino media. Together, we can work to dismantle this prejudice in our communities and start to celebrate the diversity of Filipino beauty! #MagandangMorenx trended worldwide four times since its conception. 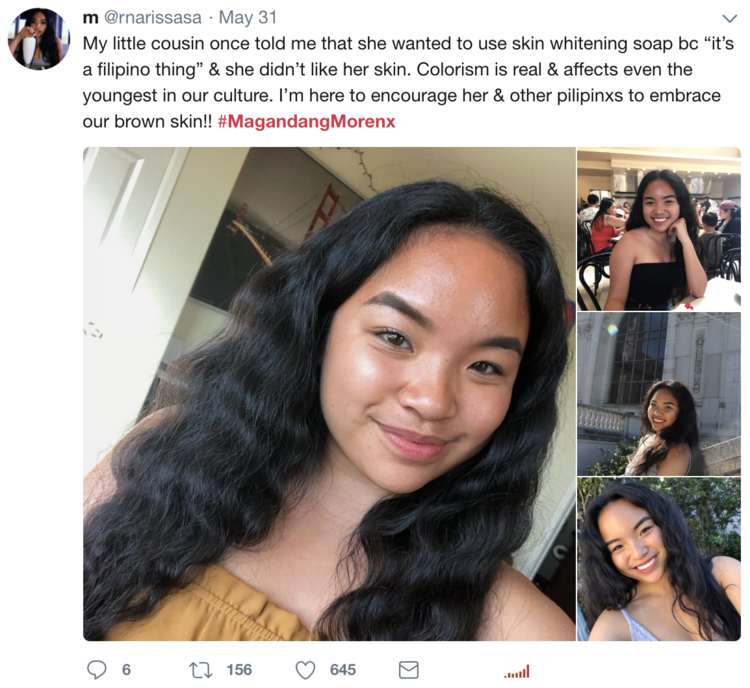 Thousands of Filipinos from all over the world shared (and continue to share) their own stories and personal experiences with colorism in Filipino culture. In October 2018, I was invited to attend and speak at the girls’ empowerment festival It’s A Girl Thing in Manila, Philippines. I spoke to 3,000+ teen attendees bringing awareness to colorism and how we can work to dismantle it. I filmed my experience speaking at this festival, which you can view down below! In addition to speaking at It’s A Girl Thing Manila, I’ve also been invited to speak about colorism at universities such as California State University, Fullerton and Brown University. I was acknowledged for my work with #MagandangMorenx at the SIPA (Search to Involve Pilipino-Americans) 46th Annual Fundraising Gala and was awarded the Lakas (Strength) Award.